OneRepublic is an American pop rock band formed in Colorado Springs, Colorado in 2002 consisting of lead vocalist Ryan Tedder, guitarist Zach Filkins, guitarist Drew Brown, bassist and cellist Brent Kutzle, and drummer Eddie Fisher. The band first achieved commercial success on Myspace as an unsigned act. In late 2002, after OneRepublic played shows throughout the Los Angeles area, a number of record labels approached the band with interest, but the band ultimately signed with Velvet Hammer, an imprint of Columbia Records. They made their first album with producer Greg Wells during the summer and fall of 2005 at his studio, Rocket Carousel, in Culver City, California. The album was originally scheduled for release on June 6, 2006, but the group was dropped by Columbia two months before the album ever came out. The lead single of that album, "Apologize", was released on April 30, 2006, on Myspace and received some recognition there, becoming number one on the Myspace charts. In 2007, OneRepublic released their debut album, Dreaming Out Loud. Its lead single, "Apologize", was remixed by Timbaland, becoming a huge international success, reaching number one in sixteen countries and subsequently earning them a Grammy Award nomination. The second single, "Stop and Stare", mirrored its predecessor's success. The album was later certified Platinum by the Recording Industry Association of America (RIAA). The band's second album, Waking Up (2009), produced the singles "All the Right Moves", "Secrets", "Marchin On", and "Good Life", with the latter reaching the top ten of the US Billboard Hot 100. On October 7, 2016, OneRepublic released Oh My My, their fourth studio album, which featured a number of collaborators, including Cassius, Peter Gabriel, and Santigold. Preceded by the singles "Wherever I Go", released on May 13, 2016, and "Kids", released on August 12, 2016, it was recognized as a change in their sound in contrast to previous albums by both critics and the band itself. In 2017, the band released the singles "No Vacancy", "Truth to Power", "Stranger Things" with Kygo and "Rich Love". To date, the band has sold approximately over 10 million records worldwide. The first incarnation of what evolved into OneRepublic formed in 1996 after Ryan Tedder and Zach Filkins befriended each other during their senior year at Colorado Springs Christian High School in Colorado Springs, Colorado. During a drive home, as Filkins and Tedder discussed favorite musicians including Fiona Apple, Peter Gabriel and U2, they decided to put together a band. They enlisted a few musical friends and named their rock act This Beautiful Mess—a phrase which first attained cult prominence a year earlier when Sixpence None the Richer released its award-winning second album, This Beautiful Mess. Tedder, Filkins & Co. had a few small gigs at Pikes Peak Coffee & Tea House, attended by friends and family. Senior year ended, and Tedder and Filkins parted ways, each attending different colleges. Reuniting in Los Angeles in 2002, Tedder and Filkins re-formed their second band under the moniker Republic. Tedder, by then an established songwriter and record producer, had convinced Filkins who was living in Chicago to relocate. Nine months later, the band signed with Columbia Records. After a few lineup changes, the group finally settled with Tedder on vocals, Filkins on lead guitar and backing vocals, Eddie Fisher on drums, Brent Kutzle on bass and cello, and Drew Brown on guitar. The band's name was changed to OneRepublic after the record company mentioned that the name Republic might result in legal action from other, similarly-named bands. The band worked in the studio for two and a half years and recorded its first full-length album. Two months before the album was due to be released, (with "Sleep" as its debut single), OneRepublic was dropped by Columbia Records. The band was beginning to gain prominence on MySpace; Tedder said it was the number-one unsigned act on MySpace, and credits the website for keeping the band together. The band caught the attention of a number of labels, including Timbaland's Mosley Music Group. The band soon signed onto the label, becoming the first rock band to do so. OneRepublic's debut album, Dreaming Out Loud, was released on November 20, 2007, and debuted at number 14 in the US with first week sales of 75,000. Critical reception to the album ranged from negative to mixed. Allmusic gave the album a modest review, stating the "album sounds derivative" but also "sounds cohesive and smoothly pleasant". Robert Christgau gave the album a negative review, and termed it a "dud". Rolling Stone gave the album 2 out of 5 stars, but placed the band in its "Artists to Watch" list, which featured ten artists that, according to the magazine, "...are bringing the future of music, today." Their lead single, "Apologize", was released in its original version from Dreaming Out Loud. Timbaland, who at the time was one of the most highly visible artists/producers, approached the band to be featured on a compilation album he was working on, Shock Value. Timbaland rearranged the song slightly to give it more of an R&B feel adding backing vocals, guitar bass line, a new drum section, and autotune to the lead vocals. This along with the strong backing of the Timbaland name made it a major hit both in the United States and internationally. It peaked a number one globally, including eight consecutive weeks on the Billboard Pop 100 chart, subsequently reaching the top three of the Billboard Hot 100. The song sold five million copies in the United States alone, receiving a five-times Platinum certification from the RIAA. The song was a massive hit internationally, reaching number one in sixteen countries, including Australia, Austria, Germany, Italy, New Zealand and Sweden. It also spent thirteen weeks at number one in Canada. It has since been certified over 2x Platinum in 6 countries worldwide, including 4x Platinum in Australia. The song ultimately earned the band their first Grammy nomination for best pop performance in a group or duo. The second single from the album, "Stop and Stare", released in March 2008, reached the top ten in eight countries worldwide, including charting at number four in the United Kingdom, and topping the UK Rock Chart. It also reached number twelve on the Billboard Hot 100, and number nine on the Pop 100. Additional singles included "Say (All I Need)" and "Mercy". The album was later certified Platinum in the United States and Germany, as well as Gold in Australia, Austria, and Canada. OneRepublic's second studio album, Waking Up, was released on November 17, 2009, charting at number 21 on the Billboard 200, and ultimately selling over 500,000 copies in the US and over 1 million worldwide. The lead single, "All the Right Moves", was released on September 9, 2009, peaking at number 18 on the US Billboard Hot 100 and being certified 2x Platinum. "Secrets", the second single from the album, reached the top five in Austria, Germany, Luxembourg, Poland and on the US Adult Pop Songs and Adult Contemporary charts. It has sold almost 4 million copies in the US as of August 2014. Furthermore, it reached number 21 on the Hot 100. The song was used in television series such as Lost, Nikita and CSI: Miami, as well as in the sci-fi fantasy movie, The Sorcerer's Apprentice and the trailer for Pretty Little Liars. "Marchin On", the album's third single made top ten appearances in Austria, Germany, and Israel, however it was the fourth single "Good Life" that became the band's most successful song from the album, particularly in the US. Released on November 19, 2010, it became their second top ten single on the Billboard Hot 100 at the time, peaking at number 8 and selling over 4 million copies in the US alone, earning a 4x Platinum certification. Rolling Stone put the song on its list of the best 15 whistling songs of all time. Waking Up was later certified Gold in Austria, Germany, and the US for sales of over 500,000, and has since sold over 1 million copies worldwide. In 2009, OneRepublic were featured on Leona Lewis's second studio album Echo on the track "Lost Then Found". On June 5, 2010, the band supported Pink on her Funhouse Summer Carnival Tour at Innsbruck. OneRepublic supported Bon Jovi at The O2 Arena for three dates in June 2010. The band supported Maroon 5 for their Hands All Over Tour in fall 2010. In November 2011, OneRepublic released their first Christmas single, titled "Christmas Without You". OneRepublic released their third studio album, Native, on March 22, 2013, marking the end of the band's three and a half year hiatus. The album debuted at number 4 on the Billboard 200 becoming their first top 10 album in the US, with first week sales of 60,000. It was also their best opening sales week since their debut album Dreaming Out Loud which sold 75,000 copies in its first week. "Feel Again" was originally released as the lead single on August 27, 2012, however after the album being delayed it was re-branded as a "promotional single". The song was released as a part of Save the Children's Every Beat Matters campaign, where a portion of the proceeds from the single's sales would be donated. It peaked at number 36 on the US Billboard Hot 100, additionally marking top ten positions in Germany and on the US Adult Pop Songs chart. The single was later certified Platinum in the US. The song was used in an official trailer for The Spectacular Now. The album's first global single, "If I Lose Myself" was released on January 8, 2013. It reached the top ten in Austria, Germany, Poland, Slovakia, Sweden and Switzerland, yet only managed to peak at number 74 on the Billboard Hot 100. The song has since been certified Gold in both Italy and Australia. On April 2, 2013, the band embarked on their headlining concert tour Native Tour in promotion for the album, beginning in Europe. This ran throughout 2013/14 and saw the band perform shows across Europe, North America, Asia and Australia and New Zealand. The 2013 North American tour was a co-headlining tour with singer-songwriter Sara Bareilles, while the 2014 Native Summer Tour was a co-headlining tour with The Script and American Authors. The tour finished in Russia on November 9, 2014, marking a total of 169 shows and the band's largest tour to date. The album's fourth single, "Something I Need", was released on August 25, 2013. Despite little promotion of the song upon its release due to the late and unexpected success of "Counting Stars", the song has still managed to be certified 2x Platinum in Australia and Platinum in New Zealand as of December 2013. On April 8, 2014, OneRepublic confirmed via Twitter that their new song, "Love Runs Out", recorded at Studio Faust Records in Prague, would be released. Tedder said that the band had intended the song to be the first single on Native, but that he could not think of a chorus for the song, so the song's release was delayed. The song was added as the second track on the album's re-release on April 14. It was also an internationally successful track, breaking the top 5 in Austria, Germany, Canada, Switzerland, and the UK; and reaching the top 15 on the US Billboard Hot 100 chart. It is used as the promotional song for the show How to Get Away with Murder. In September 2014, OneRepublic released the music video for "I Lived", the sixth single off their Native album. Tedder noted that he wrote the song for his 4-year-old son. The related video raises awareness of cystic fibrosis by featuring a 15-year-old named Bryan Warnecke who lives with the condition. A remix was released for the Coca-Cola [RED] campaign to fight AIDS. In November 2014, the group tweeted photos captioned: "Hotel recording, Poland. Album 4". and "Mid afternoon, working on new album, and this is the view ..... LP 4 is fun already" In April 2015, Ryan Tedder stated in an interview that OneRepublic was going in a whole new direction and they are yet to recycle the same sound once on any song that they have ever put out. Rhythm guitarist Drew Brown says that they are really excited about it and they think that it is the best thing they have ever done. In June 2015, Tedder said that they were working on a song called 'Colors', which he said is one of his favorite songs going on the album. In that same month, they showed a video with them working on new melodies for the album. In September 2015, it was confirmed that the band's fourth upcoming studio album would be released in early 2016. On September 9, at one of Apple's media events, held at the Bill Graham Civic Auditorium in San Francisco, Apple CEO Tim Cook concluded the event by introducing the band for a surprise performance, a 3-song set. In November, OneRepublic said on Twitter, "Yes, We are looking at a window for 1st single now, can't say what it is yet, but it's coming in the new year. Gotta narrow down songs now!" On May 13, 2016, the first single "Wherever I Go" of the upcoming album was released. On August 3, the album's official lead single, "Kids", was announced. The song was released on August 12. On August 25, OneRepublic posted that the album would be called Oh My My, with a release date of October 7, 2016. The following week, the album's artwork was revealed. Oh My My became the band's highest-charting debut to date, landing at No. 3 on the Billboard 200. On January 9, 2017, the band released their third single, "Let's Hurt Tonight", making it the soundtrack of the movie Collateral Beauty. 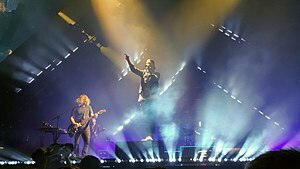 On February 16, 2017, the band were headlined at the 2017 Honda Civic Tour, which began on July 7, 2017. On April 27, 2017, OneRepublic lead vocalist and principal songwriter Ryan Tedder published a Facebook post revealing the band's future in releasing new material. In the post, he stated that he dealt with "crippling anxiety" and became ill due to constant touring, recording, and promoting the band's releases. He clarified that OneRepublic would release "new music as often as humanly possible... monthly, weekly sometimes", departing from the typical album cycle system. Singles they have released since the announcement was "No Vacancy", "Truth to Power" and "Rich Love". In September 2017, Tedder stated at a concert that the band had started work on their fifth studio album that was due to be released sometime in 2018. He estimated that there will be 7–8 songs on the album. The band opened up for the Zac Brown Band on select dates of their Down the Rabbit Hole Live tour in summer 2018. On May 16, 2018, "Start Again", a single featuring Logic was released on YouTube and other various platforms. The single is part of the Season 2 Soundtrack for the Netflix series, 13 Reasons Why. 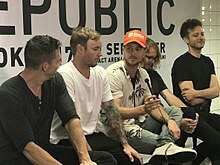 On June 26, 2018, OneRepublic released the single "Connection". On November 9, 2018, OneRepublic released a cover of the song "White Christmas" for a Jeep commercial. On January 3, 2019, Ryan Tedder announced via their official Twitter that a new album was coming sometime in 2019. It was previously slated to be released in 2018. On January 31, 2019, OneRepublic and Galantis released their song "Bones". OneRepublic's varied style of music has been described by Ryan Tedder: "We're no respecter of genre. If it's a good song or a good artist whether rock, pop, indie or hip hop, they've probably influenced us on some level... nothing's new under the sun, we're a sum of a bunch of parts." Specific acts whom OneRepublic have cited as influences include the Beatles, U2, M83, and Prince. ^ Heifetz, Elliah (2015). "OneRepublic – Native". MusicOMH. Retrieved May 22, 2015. ^ a b "Talking Shop: Ryan Tedder". BBC News Entertainment. November 6, 2007. ^ "BBC – Music – OneRepublic". BBC. ^ a b "OneRepublic Waking Up" (pdf). Campbell.edu. Retrieved June 17, 2015. ^ Freedman, Pete (December 13, 2007). "One Love: Who the Hell is OneRepublic? And What's This About Them Being from the Springs?Arijit is great". Colorado Springs Independent. ^ Amos, Joel D. (June 9, 2008). "One Republic has 'All I Need'". SheKnows. ^ Brown, August (November 20, 2007). "Rocky road to the top". Los Angeles Times. ^ Caulfield, Keith. "Blake Shelton Set for His Best Sales Week Ever on Billboard 200 Chart". Billboard. Retrieved March 29, 2015. ^ Leahey, Andrew (November 20, 2007). "( Dreaming Out Loud > Review )". Allmusic. Retrieved March 26, 2010. ^ "OneRepublic – Dreaming Our Loud". Robert Christgau. Retrieved March 26, 2010. ^ "OneRepublic: Artist to Watch 2009". Rolling Stone : Rock and Roll Daily. October 26, 2007. Archived from the original on November 30, 2007. ^ Thrills, Adrian. "He wrote Leona Lewis's huge hit Bleeding Love and stood up to Simon Cowell but Ryan Tedder just wants to be a star himself". Daily Mail. Retrieved September 7, 2015. ^ "OneRepublic's "Apologize" Hits 3 Million Download Sales". Digital Media Wire. February 27, 2008. ^ "Waking Up (Deluxe Version) by OneRepublic – Download Waking Up (Deluxe Version) on iTunes". Itunes.apple.com. November 17, 2009. Retrieved May 28, 2010. ^ "Hits And Misses Of '09!". PerezHilton.com. December 31, 2009. Retrieved May 28, 2010. ^ "Bon Jovi". The O2. Retrieved May 28, 2010. ^ Dreadale, Andrea (November 14, 2011). "OneRepublic Preps New Christmas Song, Plans New Single for March". ABC. ^ a b "OneRepublic Going 'Native' in March, Release Single". Billboard. January 8, 2013. Retrieved March 1, 2013. ^ Caufield, Keith (April 3, 2013). "Justin Timberlake's '20/20' Spends Second Week At No. 1 on Billboard 200, Lil Wayne Enters at No. 2". Billboard. ^ Twitter / OneRepublic: Perfect place to announce the. Twitter.com. Retrieved on September 16, 2012. ^ "Twitter". Twitter. Retrieved March 1, 2013. ^ "Sara Bareilles, OneRepublic Announce Co-Headlining Tour". Billboard.com. June 4, 2013. Retrieved July 13, 2013. ^ "Tour". OneRepublic. Retrieved December 29, 2013. ^ @OneRepublic (April 8, 2014). "#LOVERUNSOUT on April 14th. Sneak preview here: soundcloud.com/interscope/onerepublic-love-runs-out/s-Xn4Os ..." (Tweet). Retrieved December 1, 2014 – via Twitter. ^ "Latest Chart News". Bigtop40. ^ @OneRepublic (April 13, 2014). "Get #LoveRunsOut now on the new edition of NATIVE on @iTunesMusic! smarturl.it/native" (Tweet). Retrieved December 1, 2014 – via Twitter. ^ a b Corinthos, Aurelie (November 24, 2014). "OneRepublic's Ryan Tedder Wrote This Song for His Son – And Now the Remix Will Help Fight AIDS". People. ^ Kotesha, Nisha. "OneRepublic Join Search For Cystic Fibrosis Cure". Good News Shared. ^ Stutz, Colin (September 25, 2014). "Watch OneRepublic's Touching 'I Lived' Video, Dedicated to Fan With Cystic Fibrosis". Billboard. ^ @OneRepublic (November 1, 2014). "Hotel recording, Poland. Album 4" (Tweet). Retrieved December 1, 2014 – via Twitter. ^ @OneRepublic (November 7, 2014). "Mid-afternoon, working on new album, and this is the view ..... LP 4 is fun already" (Tweet). Retrieved December 1, 2014 – via Twitter. ^ Reid, Tashauna. "OneRepublic talks about Canadian tour and new music". CBC News. Retrieved June 17, 2015. ^ Julie Bort (September 9, 2015). "Tim Cook and Ryan Tedder selfie from Apple event – Business Insider". Business Insider. ^ @OneRepublic (November 21, 2015). "Yes, We are looking at a window for 1st single now, can't say what it is yet, but it's coming in the new year. Gotta narrow down songs now!" (Tweet) – via Twitter. ^ "OneRepublic on Twitter". Retrieved August 25, 2016. ^ Daw, Robbie (August 31, 2016). "OneRepublic Reveal 'Oh My My' Album Cover, Announce October Release Date". Idolator. Retrieved August 31, 2016. ^ Parton, Chris (January 12, 2018). "Zac Brown Band Announce 2018 'Down the Rabbit Hole Live' Tour". Rolling Stone. Rolling Stone. Retrieved February 12, 2018. ^ "One Republic on purevolume.com". PureVolume.com. ^ O'Donnell, Kevin (August 11, 2016). "OneRepublic release epic new anthem 'Kids'". Entertainment Weekly. Retrieved August 27, 2016. ^ Getz, Dana (May 13, 2016). "OneRepublic's Ryan Tedder explains how Prince inspired their new single". Entertainment Weekly. Retrieved October 25, 2016. This page is based on the Wikipedia article OneRepublic; it is used under the Creative Commons Attribution-ShareAlike 3.0 Unported License (CC-BY-SA). You may redistribute it, verbatim or modified, providing that you comply with the terms of the CC-BY-SA.